No one likes having problems with their homes – whether it be a problem with the plumbing, electricity, mold, or whatever else have you. Having these problems in America is frustrating enough, but imagine when you have a problem in another country and have NO IDEA how to even begin dealing with it. Well that just happened to me, and it was quite the ordeal. On Saturday, a pipe behind the sink in my kitchen began leaking. At first I wasn’t sure if this would be a big issue and I was hoping that it would just stop (wishful thinking – I know), but still I didn’t really know what to do besides call my landlord who lives over an hour away in Tirana. So I decided that whatever the leak was, that it could probably wait a night because I had plans to visit some friends in Durrës. And to my defense, it looks like there is a drain on my kitchen floor, so I assumed that the water would just go into the drain if it reached the floor (again – more wishful thinking). 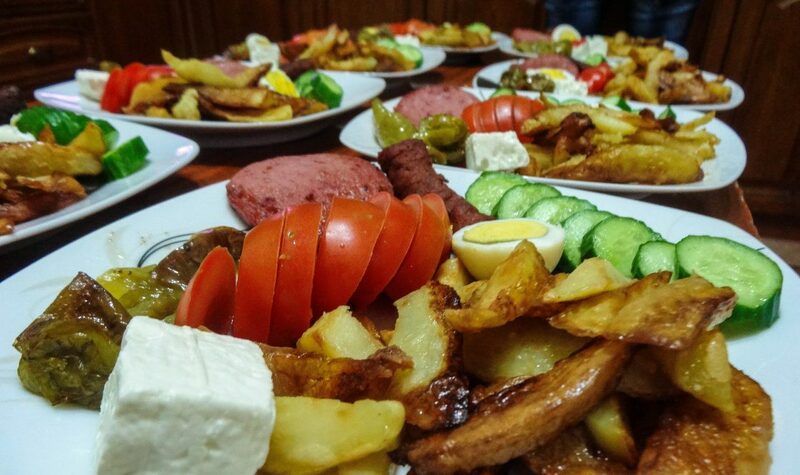 Later on, I received a call from my landlord’s wife while I was eating dinner in Durrës telling me that she had received several calls from the nieghbors below me that I left my water on and it was leaking into their house. Whoops. I explained to her the problem and she asked me if I could go back home to turn off the water. One of the problem’s about relying on public transportation is that is was already 8:30 when she called, so there was no way I could travel back to Kavajë safely at that hour by myself. And they did not want to travel from Tirana to turn off the water either, so we just decided to wait and I told her I would be back home early the next day to deal with the issue. Come Sunday, I left Durrës early to return home to a kitchen flooded with about two inches of water. Luckily the water stayed only in the kitchen and nothing in my apartment was ruined, but it still wasn’t an ideal situation to be in. I continued to call my landlords for several hours, but could not get a hold of them. So even though I was home, there was NOTHING that I could do about the situation because the water kept on flowing. There is no such thing as the Albanian yellow-pages. You have a friend of a friend who knows a plumber and that is how business is done. What used to be a steady leak turned into a mini-waterfall. Obobo. To top off this problem, I was having a fellow traveler come stay with me for the night on his way backpacking across Europe. Of course I would be entertaining someone the only day that I have had issues with my house thus far. At least I have a back-up supply of filtered water, so it wasn’t too big of a deal for him. In the early evening, my water supply was exhausted for the day, so the flooding of my kitchen stopped and I finally received a call from my landlord. They told me that the neighbors below were going to come up and check out the problem and then fix it, but alas, my neighbors never came upstairs. So finally, Spencer (my backpacking friend) and I left so I could give him a tour of my little city. On the way out the door we ran into the old man who lives below me and he kept talking to be in really fast Shqip that I couldn’t understand, but he hustled ups up to his apartment so I could witness the damage that happened from my flood. I kept telling him I didn’t know what to do because I didn’t have the key to turn off the mini water-tank outside my apartment and obviously I am no plumber. Plus the issue was behind the wall, so it wasn’t my fault – just normal apartment wear-and-tear. Now it is Monday. And still nothing has been fixed. I was woken up around 6am because of a huge outpour of water from the pipes. Another flood – yay! I continued to call my landlord and told him he needed to come today to fix this problem because now the water has not only flooded to the third floor, but supposedly to the second and first floors as well. My landlord came over after work with a plumber and they eventually fixed the problem. It was interesting when my landlord finally showed up because my friend Spencer was still at the house and my landlord was more interested in discussing this problem with Spencer (because he is a man and should understand these things), rather than me because I am a woman living alone. My landlord actually mentioned to Spencer several times that I am “so lonely” here by myself and that I am “helpless.” Lonely and helpless are definitely not words that I would use to describe myself, so I was kind of annoyed. While at times here I cannot fix things myself it is not because I am helpless and I am definitely not asking for everyone’s help for every little issue that I face here. If anything, I am independent and strong – the opposite of helpless. I am a woman in a society dominated by men and I am crushing all those stereotypes, even though I may need help fixing a pipe that in no sense means that I am helpless. And while I can’t deny that life here can get very lonely, I don’t consider myself a lonely person. I explained to my landlord that there is a difference between being lonely and alone. I think it was a good learning experience for him. It is difficult to deal with the outright sexism here at times, but I just have to keep on keeping on. Women in this society are just not perceived the same way as men… and honestly this is still a problem EVERYWHERE in the world – including America. So I thanked my landlord and the plumber with homemade cookies and they were on their way. I hoped that my problems would be over, but again – wishful thinking. On Tuesday, my pipes were no longer flooding, but now my apartment had no water. No water to take a shower with, no water to wash the dishes with, no water to flush the toilet with. NO WATER. Again, “helpless little me” had to call my landlord to have him help me out and bring me the key to the water-tank. He came over after work and informed me that he has been receiving many complaints from the neighbors regarding the water and that a guy that I spoke with the day prior broke into my water tank to turn off my water supply. He also mentioned that I told this guy I was going to call the police?! I have NO IDEA what he is talking about, I wouldn’t even really know how to contact the police in a situation like that anyways. But I guess that my water ended up leaking onto a $25,000 dental machine that is kept on the first floor and that it damaged the machine. I still have no idea what is going on with that whole situation, but my landlord told me not to worry about it. I guess I gave the impression in my broken Shqiplish that I was going to get law enforcement involved – nuk e di (I don’t know). The whole situation is confusing and weird. I don’t even know why someone would keep a dental machine in our apartment complex. After my landlord came back and turned on my water, we went out for a coffee and he spoke with me about how he has to be careful regarding how much he can help me. This is not because of his relationship with his wife because she doesn’t care, but other people in the community do not understand and would begin to gossip about our relationship. On Wednesday morning I still had no water, but it finally came back in the afternoon. After several days of not having water it felt good to finally take a shower and do the dishes. I really hope I do not have another problem like this in the future, but if/when I do I think I will be more ready after this mishap. Last Friday my health program manager from Peace Corps came to visit me at site and help me with meeting more people around town. I am so grateful that she came because I feel like after her visit my life here has done a 180 and I am feeling a lot less discouraged with the progress that I have made thus far and the progress that I will make in the future. I really have to commend Darina, my program manager, because I feel like her visit helped open so many new doors for networking and future projects. As many of you know, I have been feeling a bit frustrated with work and with my counterparts attitudes towards future projects, so this visit was definitely necessary. I was starting to feel extremely dispirited and was beginning to worry if I would ever be able to accomplish anything at this site. So when Darina came we started off in the DShP, my assigned place of work through Peace Corps. My counterpart was not there because she will be working at the Health Center at a beach nearby for the next two months. We were going to try and have a coffee with the director of the DShP, but he has not been to work in several weeks. He was a director under the Sali Barisha, the democratic leader, so it is likely that someone will replace him as director, come September when the socialist party comes into power. Since the director wasn’t there we began talking with some of the ladies in the other offices and quickly began to realize that they are all interested in working with me and would love to have my help. Yay! And the awesome thing about the other ladies in the office is that they only speak Shqip, which means I get to practice more and get better! One of the ladies is interested in learning English come fall and I told her that I would help her learn, so I am going to begin putting together lesson plans for her to help improve her English (and hopefully that will help improve my Shqip as well)! Many of the ladies told Darina that I am always extremely friendly and upbeat when I come into the office, so that gave me a nice confidence boost as well! I knew that smiling and my awkward laugh would eventually get me somewhere! I also got connected with the other promotion doctor/nurse pair that works in the DShP and I will begin working with as another counterpart pair to do health education promotion in the fall. They work closely with the kindergarten and other schools in town, so I am really excited to begin working with them as well as my initial coworkers because that is DOUBLE the health promotion activities that I would be doing otherwise. I also met some nurses who work with pregnant mothers and their children, so they could be a good resource for future projects regarding Peace Corps health goal 4 to have “community members adopt behaviors and practices that contribute to improved maternal, neonatal, and child health outcomes.” After meeting all these potential work partners at the DShP Darina and I had coffee and met with the school psychologist that works at the high school that my site-mate Kate teaches at. He is working on some projects with kids on the weekends passing out materials to people at the beach on the weekends. I think that he will be a really good connection into working with the schools and kids! He may be working with some youth handing out information (brochures) on the beaches during the weekends, so hopefully I can begin helping out with that project. I think he could be a good connection to starting the youth group in town as well. Following the coffee, Darina and I went to the local nursing home. We had an interesting interaction with the staff and director there, but they are also interested in my help. It seems as though the conditions of the home are not up to standard according to the information they were giving us, so this could be a possibility for a grant project in the future. Darina also spoke with my current counterpart and explained what my role is as a volunteer in the DShP, so hopefully that partnership will continue to grow and get better in the future. Overall, the day was really uplifting and I am excited for the possibilities in the future. But for now, it is summer in Albania and summer in Albania is vacation time for EVERYONE. Hardly anyone goes into work during the summer, and if they do it is likely that they aren’t actually doing work (by American standards at least). So I am going to do as the Albanians do, and take a much-needed and deserved break. It is important for me to remember that I can’t rush things here and that building relationships in these initial stages at site is one of the most important aspects to future work. I have been attending tutoring sessions three times a week and the lessons have been continuing to get better with time. Plus my tutor is a literature teacher at the high school who is in charge of the library, so she is a good connection to have (maybe I will be able to use the space for youth group meetings). Now that I have all these new potential coworkers my motivation to learn Shqip has been revitalized. Then I will go into work and chat with some of my office mates, maybe have a Turkish coffee, and then head home or do errands around town. Usually I am only at work for about an hour or two everyday, but speaking in Shqip for an hour or two is extremely exhausting. Sometimes I go to the Cultural Center (where I eventually want to do yoga and hoop-dancing lessons) and watch my friend Besmir give guitar lessons (I am secretly hoping that maybe he can help me learn guitar while I am here). Even though there is not much going on at these places I continue to go in to build relationships and remind them that I am here and willing to work when they decide. I spend the afternoons devoted to “me time” and I have begun working out daily with pop-pilates videos online and yoga. Along with working out I have begun to eat a more healthier diet, as many of you know I was unhappy with my body after all the bread my host family fed me daily. I have begun catching up on a lot of American media and listening to Albanian music videos on my tv. Everybody here has basically informed me that no work will be happening until September though, so I am going to soak up the sun, visit my friends across the country, and enjoy summer pushim aka vacation. 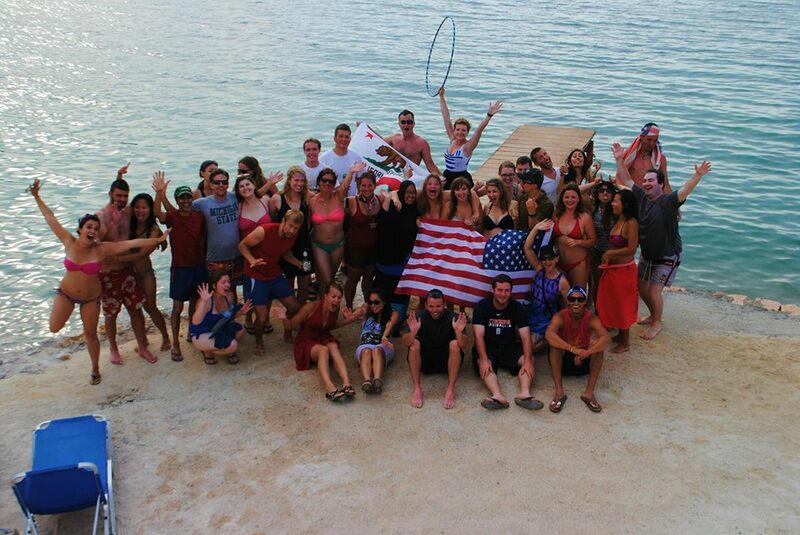 Last week I had the opportunity to travel down to the southern beaches of Albania to celebrate the 4th of July with a bunch of other volunteers. 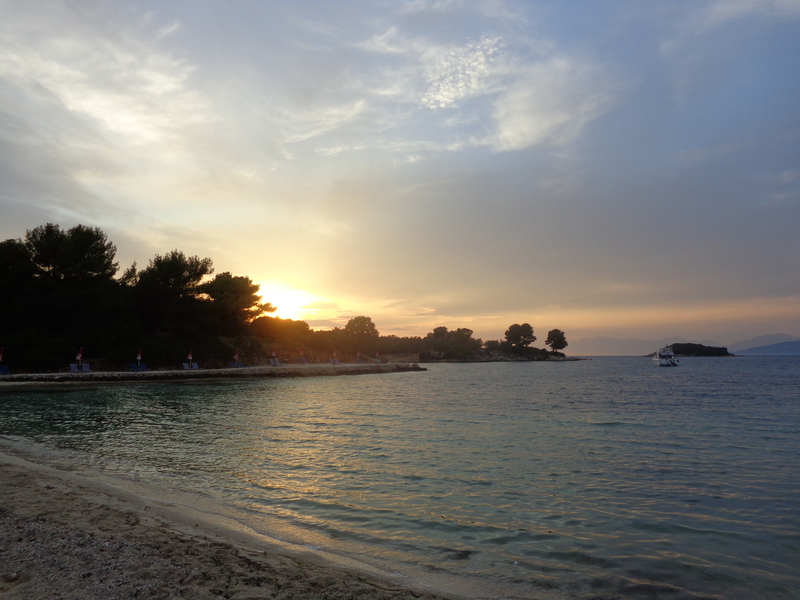 I stayed in the small tourist beach town of Ksamil with a fellow volunteer who is posted there. It was nice to celebrate the holiday with friends, but nothing can compare to the wonderful 4th of July memories that I have from the states – especially those nights I spent in the mountains at the lake watching fireworks with my family. My site-mate Kate and I traveled down together, which was nice because even though Albania is a small country it still took us quite some time to get from Kavaje to Ksamil. We walked about 10 minutes to the highway near Kavaje to try and catch a furgon to Saranda. We waited on the side of the highway for about fifteen minutes and finally found a furgon to take us down south. Luckily, it was a comfortable ride, so that was definitely nice. Sometimes furgons can be quite uncomfortable because of many different factors including how many people are crammed into the car, how hot it is outside, how hot it is inside the furgon, if the people next to you are wearing proper deodorant, and the reliability of the vehicle. Kate and I had never traveled that far south before, so neither of us had any idea where we were going (this is a common theme for me living in Albania). 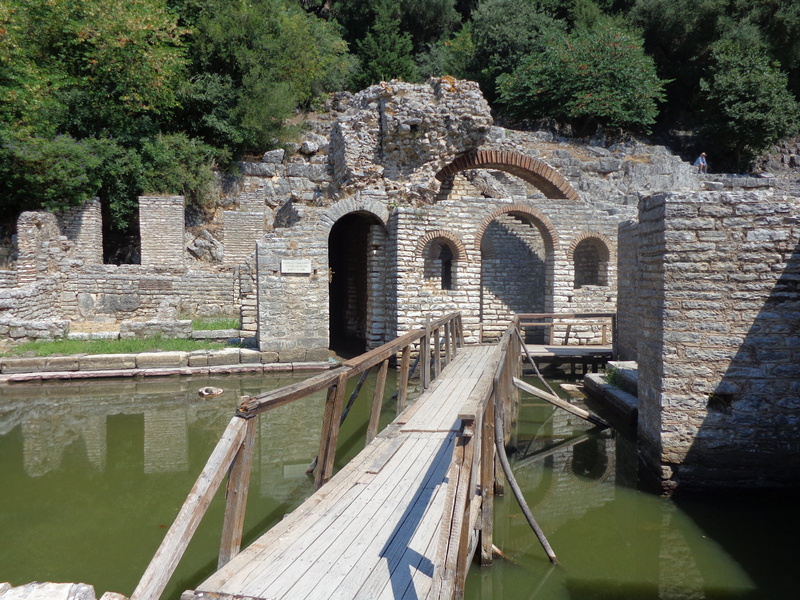 We ended up taking a route through Gjirokaster and other central cities and in Gjirokaster we switched furgons and got into a different car. I have no idea why we switched furgons, but as I mentioned before, traveling in Albania is confusing at times. After transferring furgons we finally made in down to Saranda five hours later and out thirteen dollars. Believe it or not, thirteen dollars is a VERY EXPENSIVE furgon ride, especially on my small Peace Corps budget. 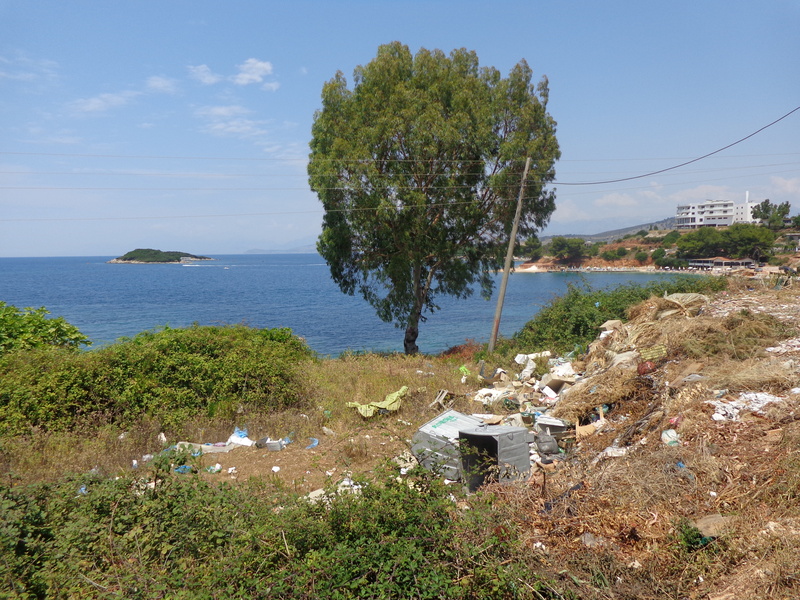 Once in Saranda, we met up with other volunteers and took a short bus ride to Ksamil. We hung out on the beach and relaxed near the beautiful sea. The water in southern Albania is very different than the sea water near Kavaje. In the south the water is crystal clear beauty along gorgeous white sand beaches. It was definitely a beautiful place to celebrate the holiday. 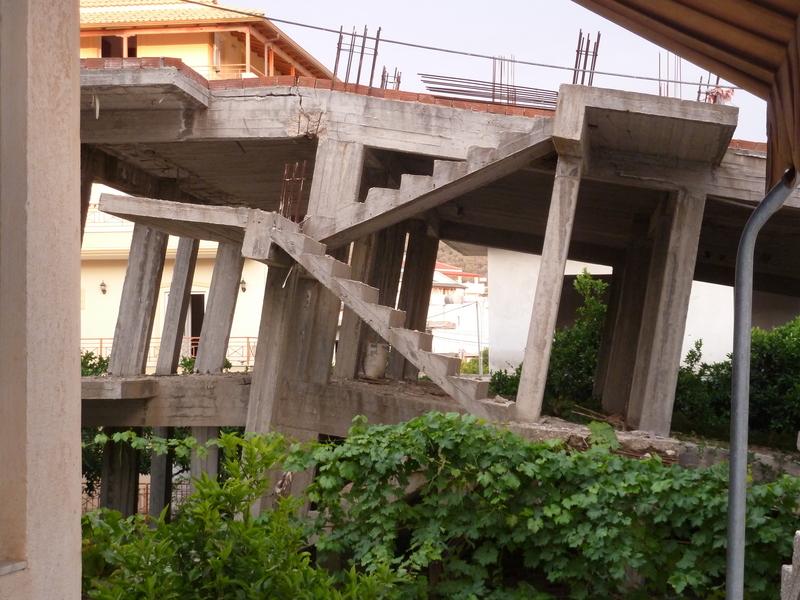 There are many half-constructed buildings in Albania. This one happened to be about 33% off, which we concluded was a good metaphor for life here in Albania. 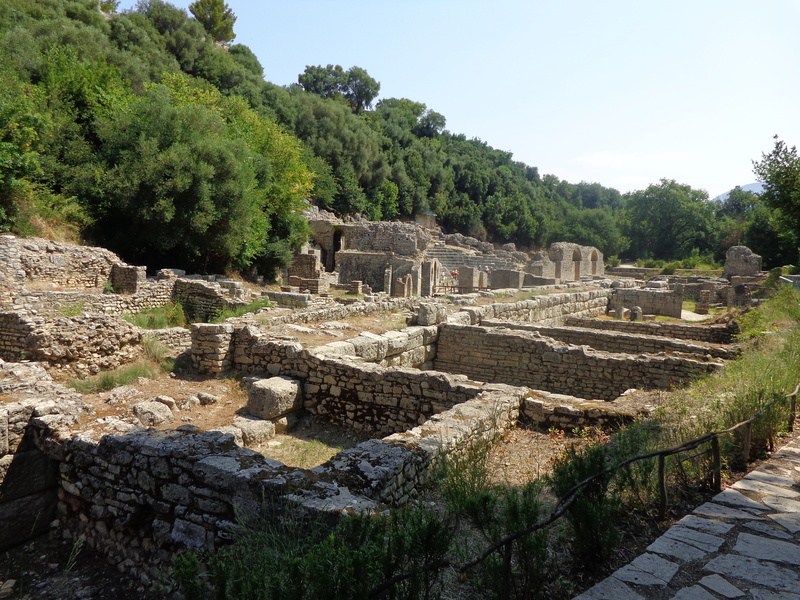 The next day was the 4th of July and I went down to the UNESCO World Heritage site of Butrint. 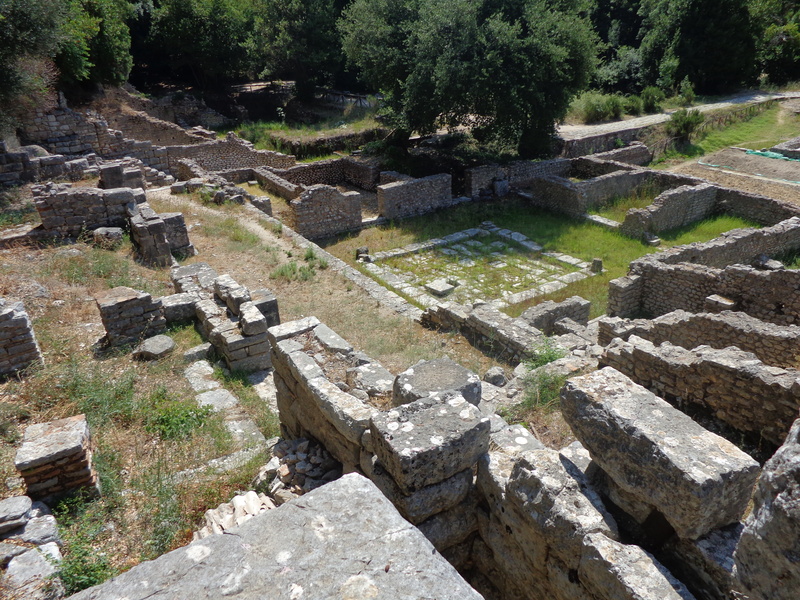 I explored the ancient ruins and tagged along with a tourist group for a while listening to the guide speak about the history of the ancient beauty. They were definitely the best ruins that I have seen thus far and I am glad that I went. After Butrint, I met up with the rest of the volunteers and enjoyed the day on the beach with great volunteers, great spirits, and great views. Even though I missed the majestic Colorado mountains, I have to admit that the picturesque sea with new friends was just as special. 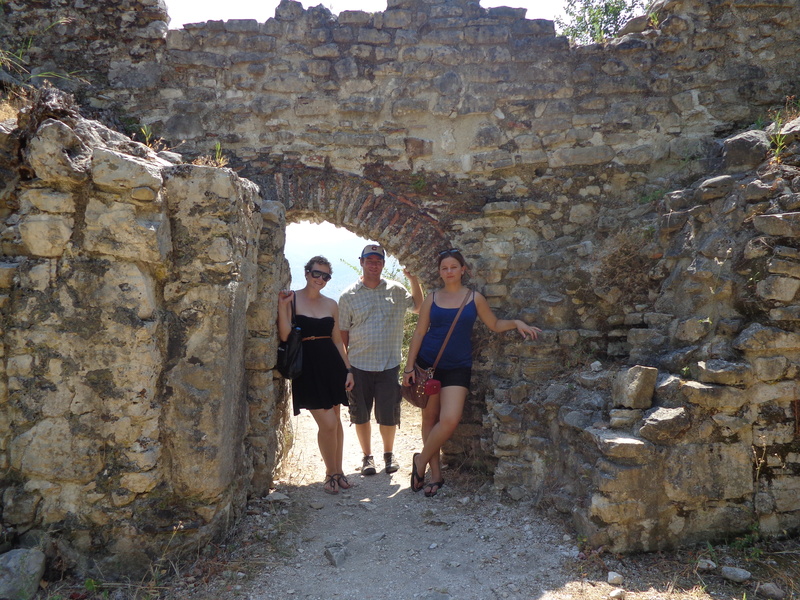 After our festivites, I headed back up north and stopped in Berat to hang out with Dan. Sometimes life in the Peace Corps can get kind of lonely, so having friends that I can count on to just hang out with is really essential. Luckily, I have several of those friends, including my site-mate and others who are very close by (and by close by I mean within 3 hours). The ancient mosiac that is only uncovered periodically to keep the color. I was lucky enough to get to view it!! 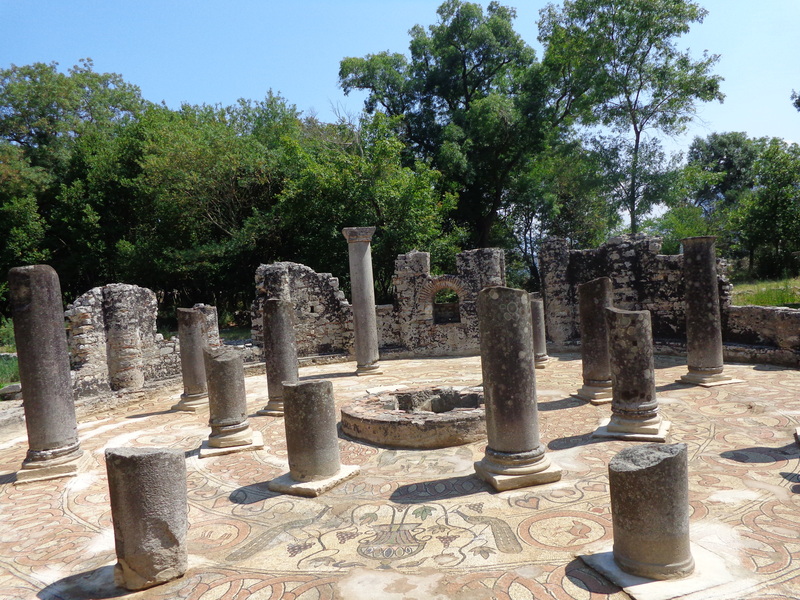 The group of us who went to Butrint. Hooping all over the world. Even amongst the beauty there is still hidden trash. The beautiful sunset. Everyday I am so thankful to live in such a beautiful country. And the cliche “Kumbaya” circle did happen… and it was AMAZING. 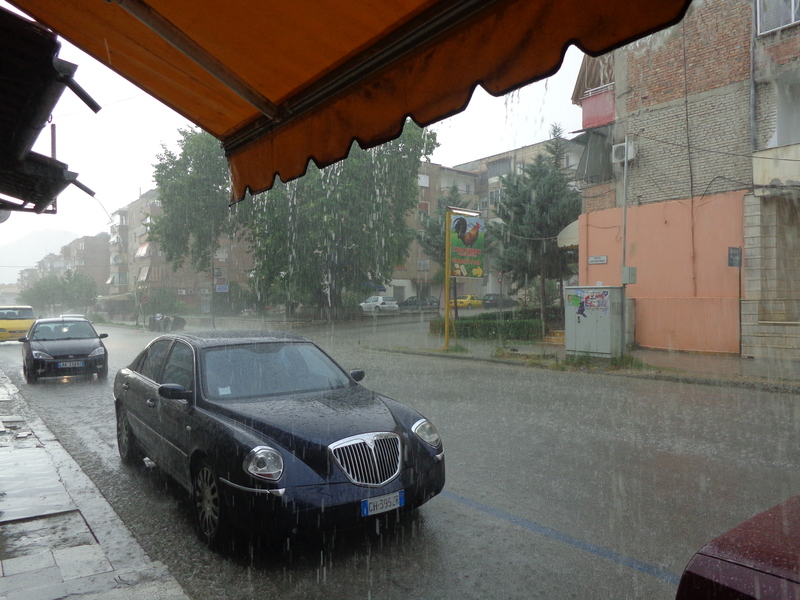 After Ksamil I stopped in Berat and it was raining pretty hard… definitely got soaked in this storm. After the election, everything went back to usual. The volunteers were taken off “standfast” relatively quickly and the elections were overall successful. Nothing seemed to be out of the ordinary in my city, so that was nice. All that worrying for nothing. Edi Rama won the election and now the socialist party will be taking over the government. I am very interested to see the changes that will happen now that Albania has a newer, younger prime minister from a different political party. Besides the excitement of the recent elections, things around here have been anything but “exciting” for the most part. I have been going through an emotional rollercoaster when it comes to work and “culture shock” as coined by Peace Corps. Some days it is exhausting to even leave my apartment, and other days I am ready to take on the world and go meet all my neighbors and have multiple conversations in Shqip. Some weeks have been others, but lately I have felt somewhat unmotivated. I have begun getting to know members in my community, especially my neighbors, and I have begun networking more with the culture center in town. On Saturday I went with my friend Besmir, my contact at the culture center, to watch some of the youth practice traditional Albanian dance. The youth can take lessons for free through the culture center and the teams have even performed in competitions internationally. I enjoyed watching them very much. I am very happy to have more Albanian friends in the community and hopefully they will be good support for the future. My neighbors like me so much that they even made me a special dinner that they brought to my house on Sunday – baked peppers stuffed with an amazing meat sauce (I will eat non-vegetarian when it comes to “tasting the culture”). They were really delicious and greatly appreciated. I brought them some cherries today to repay their kindness – I think that we will become good friends. I want to help them practice English and they can help me practice my Shqip. Win win! But as I mentioned, some days have not been that great. The small things are where I really have to find successes because work is extremely frustrating right now. When I go to work we do not really do any work. I go into the office around 9am and chat with the ladies in my office for 20-60 minutes. After that, my counterparts have been leaving the office to go buy cheese, dresses, and “do work” that I am not invited too. I have felt sad about being left in the office by myself, but I have used that time to work on language building through manuals from PST. Several days my office has also had internet (which is extremely rare), so I spent that time downloading information regarding the Roma community in Albania, information about a project that a fellow PVC wants to starts regarding pap smears with vinegar, and health lessons that we could teach in the fall to the schools. My counterparts have expressed before having “turp” (shame) regarding handing out health information in the center of city or setting our brochure table up outside of the DShP courtyard. The underlying “turp” is a common theme in Albanian society and it isn’t even something that I can begin to comprehend yet, maybe get back to me in a year once I have experienced this culture more. These interactions with my counterparts are confusing to me because sometimes I feel like my opinions are not taken into consideration, but I think that the issue is more of a culture clash than anything. When my counterparts refuse to do things that seem simple to me, such as moving a brochure table or doing group-work during lessons in the fall, I feel disappointed. I really want to help and offer new ideas, but things are going very slow. I appreciate my counterparts and I know that Albanian has an “avash avash” mentality and I am so excited to begin working together, but doing any work in general is just not happening. So lately things have felt like they have been on standstill here. I think the hard part about my job here is that I have to define what I want my job to be and it is becoming more apparent that I need to begin networking with people other people in the community who want to work on projects and are receptive to my different ideas. That is just overwhelming, especially with my basic language skills, so I guess this will just be another aspect of my service that is avash avash. On the bright side, my friend Dan came and visited me this past weekend and that was a nice surprise. We made dinner with my site-mate and then went out for drinks in Kavaje. I am very grateful that I live in a more progressive site where women are seen out in the evening hours. We ended up meeting some friendly Albanians at the local who took us dancing at a club in Durres. It was quite the adventure and it was really nice to be in an actual car. I am so accustomed to traveling by furgon or bus that riding in a car is quite the treat. 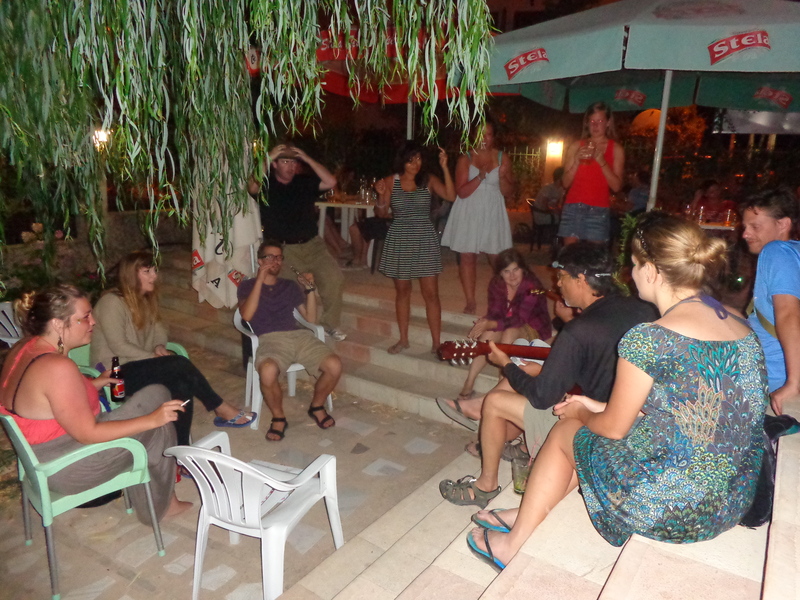 In Durres, we met up with another volunteer and got to know some more friendly Albanians in a bar there. Overall, it was a great trip and I had a fun time. Tomorrow I am traveling down to Ksamile, a city in the far south of Albania, for a big 4th of July party on the beach. I am so excited and will give you updates after!